The participants of the Training on Cassava and Sweet Potato Production at So. Crossing, Brgy. Taglawigan, San Isidro, Leyte on 16 April 2013. 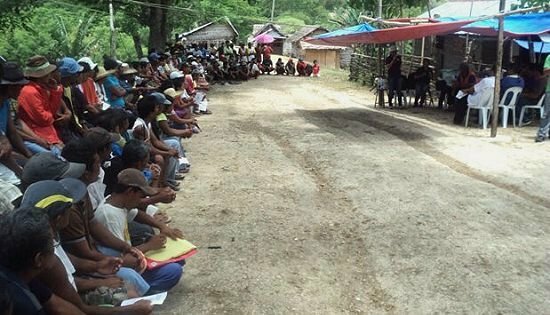 KANANGA, Leyte – The 802nd Infantry Brigade and 19th Infantry Battalion are now working on the gradual implementation of the livelihood enhancement programs to its eight (8) newly organized farmers and fisher folks associations in Leyte’s Calubian and San Isidro towns. This was after the successful conduct of the “Training on Cassava and Sweet Potato Production” to three hundred farmers at So. Crossing, Brgy. Taglawigan, San Isidro, Leyte on Tuesday, April 16, 2013. The training which was facilitated by the Philippine Rootcrops Research Center based in Visayas State University (VSU), Baybay City in partnership with the Fatima Multi-purpose Cooperative Incorporated aimed to introduce modern technologies, excellent varieties of crops and techniques to increase production of cassava and sweet potato among farmers. The training also includes lecture on; “Management and Control of Insect Pests and Diseases on Rootcrops” by Dr. Erlinda A. Vasquez, a VSU Professor and Entomologist, “Cassava Production Technology” by Mr. Dioscorro M. Bolatete, Senior Agriculturist of PhilRootcrops, and “Sweet Potato Production Technology” by Mr. Enrique B. Abogadie, a Senior Production Expert and Germplasm Curator. Other lecturer was Mr. Nilo Pesquera from the Philippine Crop Insurance Incorporated who stressed the importance of crop insurance to farmers especially during occurrence of natural and man-made calamities. Lt. Col. Joel Alejandro S. Nacnac, Commanding Officer of 19IB stressed that the training is just a start on more comprehensive programs and opportunities for subsistence farmers to increase their production and earn extra income for other basic needs. The military in Leyte under the leadership of Col. Rafael C. Valencia, Commander of the 802nd Infantry Brigade had been coordinating with the different government agencies in the region, provincial and municipal level to ensure that the farmers’ rights and benefits are protected. As of now, all eight (8) newly organized farmers and fisher folks associations namely: Taglawigan Farmers Association, Taglawigan Fisher Folks Organization and Catoogan Farmers Association in San Isidro, Leyte; Sorosimbahan Farmers Association, Jubay Farmers Association, Airport Farmers Association and Cabatoan Farmers Association from Calubian, Leyte; and Libertad Farmers Association in Kananga, Leyte were officially registered at the Department of Labor and Employment (DOLE). CAMP SEC. KANGLEON, Palo, Leyte – The number of violators of the current election gun ban arrested by Police Regional Office 8 (PRO8) in Eastern Visayas has reached 98 after police arrested a businessman in Ormoc City for poking his gun to a market vendor on Monday morning. Police Chief Superintendent Elmer Ragadio Soria, PRO8 Regional Director, informed that various police operations conducted by his men have resulted in the arrest of 98 persons since the ban was enforced early this year. “The arrests were made through the implementation of checkpoints in strategic areas in coordination with our AFP counterparts and other police operations like implementation of search warrants, police response to calls for assistance resulting in the apprehension of suspects and intelligence-driven operations,” Soria said. A total of 83 high-powered and low-powered firearms, 5 airguns and firearm replicas, 36 bladed weapons, 7 hand grenades, 3 rifle grenades, 1 improvised explosive, 52 blasting caps and several rounds of ammunition were confiscated by the police. Soria further informed that 79 cases for violation of Republic Act 8294 (Illegal Possession of Firearms) in relation to COMELEC Resolution No. 9561-A were filed against the suspects in different courts throughout the region. The Commission on Elections deputized the Philippine National Police to strictly implement the gun ban, which seeks to minimize election-related violence, that started last January 13 and lasts until June 12. While it is in effect, bearing, carrying and transporting firearms and other deadly weapons are prohibited unless authorized in writing by the Comelec with only law enforcers on duty and in full uniform are allowed to carry firearms outside their residence. In related development, a 38-year old businessman in Ormoc City is the latest addition to the list of gun ban violators in the region. Elizer Bakunawa, married, and a resident of Brgy Linao, Ormoc City was arrested by responding elements of Police Station 1, Ormoc City Police Office after receiving a complaint from one Ali Asa Abdul Assi, 33, married, public market vendor for allegedly threatening him on early Monday morning by pointing a gun to him while under the influence of intoxicating liquor. The responding lawmen apprehended the suspect who was caught while in his possession and control one unit Glock 19 caliber .9mm pistol with serial number AAIN583 with a magazine loaded with 14 live ammunition. The suspect failed to present any legal documents and exemption from the COMELEC for carrying said gun. Bakunawa was brought to Police Station 1, Ormoc CPO for proper disposition while a case for gun ban violation is being prepared for filing in court against him. CAMP SEC. KANGLEON, Palo, Leyte – The intensified campaign against most wanted persons being undertaken by the Police Regional Office 8 (PRO8) in Samar province and other parts of the region will help ensure the conduct of secured and fair elections (SAFE) in May 2013. “Wanted criminals may be recruited by some unscrupulous politicians and maybe used to ensure their victory through violent means, going after these criminals is one measure being adopted by PRO8 in line with our SAFE 2013 program,” said Police Chief Superintendent Elmer Ragadio Soria, PRO8 Regional Director. This developed as the Regional Special Operations Task Group (RSOTG-Samar) Tracker Team 1 collared Danilo Diosa y Montemayor alias Danny at his hiding place in Brgy. Sinidman Oriental, Calbayog City at around 2:00 AM on Friday, April 12. Facing charges of Frustrated Homicide and Direct Assault with Attempted Homicide before the Regional Trial Court Branch 32 in Calbayog City, Diosa is ranked number 9 in the list of top ten most wanted persons of Cabayog City. The joint police team from RSOTG and Calbayog City Police Station led by PSInsp. Shyrile Tan was armed with an arrest warrant issued by Judge Feliciano P. Aguilar in Criminal Case number 6833 with recommended bail bond fixed at P24,000.00. RSOTG-Samar is a special police unit organized and deployed by PRO8 to lead in the implementation of the Secured and Fair Elections (SAFE 2013) program and augments the local police force in Samar, earlier classified by the Department of Interior and Local Government (DILG) as a “priority area”, in the forthcoming polls. Since its activation, RSOTG has arrested 15 most wanted persons, some were members of Private Armed Groups (PAGs), neutralized two in a shoot-out with one surrenderee. The recent accomplishment is a big boost to the campaign for a peaceful, honest and credible May elections in Samar, Soria added. PASAY CITY – Senator Alan Cayetano hailed the Supreme Court’s (SC) decision to lift the Commission on Elections (Comelec) limit on political advertisements a victory for democracy and for voters in poor rural areas with limited or no access to national television (TV). "Information about candidates should reach every Filipino family, not only those with access to national TV," Cayetano said. "This decision is a victory for voters, especially the poor in remote rural areas who now have the opportunity to hear more about the advocacy of various candidates." Cayetano said that Comelec’s fear of this decision benefitting candidates with bigger budgets is unfounded because the candidates’ spending limit of P3 per voter remains unchanged. "What the Comelec should do now is monitor the spending of each candidate and, more importantly, check that the funding of candidates is not from illegal means like jueteng or drugs," he said. Comelec Resolution No. 9615 limited national candidates to only 120 minutes of airtime for television and 180 minutes for radio during the campaign period. Meanwhile, local candidates were only allowed 60 minutes for television and 90 minutes for radio. This was done in an effort to curtail campaign spending. In the past, the agency limited advertisements on a per-station basis. The Supreme Court voting 9-6 earlier today issued a status quo ante order halting the implementation of the said resolution – an act that Cayetano has long been petitioning for. Cayetano is the only party of interest as a senatorial candidate who filed a Petition-in-Intervention in the case. "I intervened in this case because I realized that the limit on ad placements deprives our voters of their right to be informed about candidates. The Comelec should encourage instead of discourage candidates to make an informed choice on the candidates they will vote for," he said. The case was filed by the Kapisanan ng mga Brodkaster sa Pilipinas (KBP), GMA Network Inc., Radio Mindanao Network (RMN), Bombo Radyo and TV 5. 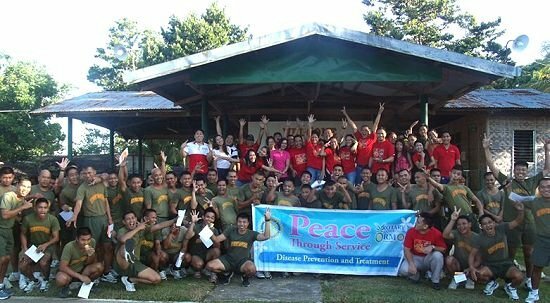 KANANGA, Leyte – Soldiers of the 19th Infantry (Commando) Battalion and their dependents were grateful of the services extended by the Rotary Club of Ormoc during a medical mission held at the formers camp in Brgy. Aguiting, Kananga, Leyte on Saturday, April 13, 2013. The medical mission which was facilitated by Mr. Wesley Chu, president of the Rotary Club of Ormoc and other 40 Rotarians benefited a total of 235 individuals who availed of free urinalysis and cholesterol and sugar level examination. Aside from the medical consultation, medicines were also distributed for free by the Rotarians. Lt. Col. Joel Alejandro Nacnac, commanding officer of the 19th Infantry Battalion who is also a Rotarian said the medical mission was conducted to check the health of the soldiers and their dependents. He likewise expressed his utmost gratitude to his fellow Rotarians for choosing 19IB as one of their beneficiaries. The Rotary Club of Ormoc had been lending hands to 19IB in various undertakings since 2012. It can be recalled that the Rotary Club and 19IB launched a Youth Leadership Summit in Ormoc City on October last year. An election law seminar on January this year was also conducted by the Rotary Club for the 19IB soldiers and Ormoc City police. The Rotary Club of Ormoc is also one of the organizations who respond to the needs of medical assistance of the less fortunate people from poorer communities in Ormoc City. CAMP SEC. KANGLEON, Palo, Leyte – Police Chief Superintendent Elmer Ragadio Soria, Regional Director of Police Regional Office 8 (PRO8) lauded the efforts of the army and other law enforcement agencies in Eastern Visayas as he encouraged everyone to continue with good initiatives in ensuring a peaceful conduct of the May 13 elections. “The collaborative effort between the Comelec, PNP and our AFP counterparts, together with the support of other government agencies is a laudable effort that contributed greatly to the tranquility of the election atmosphere,” Soria said during the Regional Joint Security Control Center - Regional Law Enforcement Coordinating Council (RJSCC-RLECC) Joint Conference held at PRO8 Matapat Hall last Thursday. PRO8 has no recorded election-related violent incidents since the start of the election period. “This noble partnership will ensure the safe exercise of the people’s sacred right to vote in the elections and we are optimistic of attaining our goal of zero-casualty for this year’s polls,” the top police official added. The Comelec, AFP and PNP have activated the Joint Security Control Centers (JSCCs) to serve as focal point for all security coordination related to the elections while the RLECC is coordinating mechanism for all law enforcement activities of various government agencies to ensure unified direction and integration of law enforcement efforts. The police official further assured that PRO8 will continue to implement pro-active police operations to ensure safe and secured elections by assisting the Comelec in the implementation of elections laws, rules and regulations; and deter or deny private armed groups and other threat groups from conducting election-related violence. These police activities includes the continuous conduct of fixed/mobile checkpoints especially at pinpointed critical strategic locations; accounting of wanted persons and loose firearms; prepositioning of PNP reaction teams in areas believed to be of immediate concern and deployment of elements from the Regional Public Safety Battalion (RPSB8) to support police provincial offices and police stations. “We will also continue other activities like initiating peace covenant signings, prayer rallies and dialogues with political leaders to ensure that they will not result to violence to advance their political interests,” Soria added. QUEZON CITY – The number of Filipinos aspiring to have extra jobs to augment current income to make both ends meet have reached almost 9 million and the Trade Union Congress of the Philippines (TUCP) attributes this to job mismatch and low salary workers receive. Underemployment refers to people who desire to have an additional job or to work for longer hours for additional financial resources aside from their current employment. While a job mismatch, for example, are those nurses and teachers who end up employed as salesladies. In Metro Manila, although the minimum daily pay is 456 pesos, the real daily take home minimum pay is only 306 pesos after factoring inflation of basic commodities and after mandatory deductions of taxes, Philhealth, Pag-ibig, and SSS, Seno said citing a recent TUCP study. The National Statistics Office (NSO) record showed there are 7.934 million underemployed in January 2013, up by 916,000 since January 2012 (7.018 million) and 7.050 million in 2011. The all-time high underemployment rate in six years was recorded in July 2012 with 8.55 million with more than 80 per cent of them in the agriculture and services sector like security guards, tellers, clerks, waiters, mechanics, technicians, salesladies, and service crews. In the light of the issue, the Labor department introduced nationwide the Community Entrepreneural Development Training (EDT) and the Integrated Livelihood Program (ILP) to encourage workers to engage in livelihood like selling home-made food and items to augment family income. The TUCP filed an 85-peso wage increase petition for Metro Manila before the wage board April 3. They also filed an 80-peso wage increase in Davao regional wage board on April 10. If granted, Davao workers will receive a minimum nominal pay of 381 pesos. The current 301 pesos minimum pay in Davao region has a buying capacity of only 216.24 pesos. After mandatory deductions, the real take home pay is only 191.75 pesos. PASAY CITY – Senator Chiz Escudero reminded public servants not to backslide from the straight path policy of President Benigno Aquino III amid results of Commission on Audit (CoA) audits finding excessive allowances and benefits persisted among agencies and state firms. “There must be no let-up in the campaign for good governance and anti-corruption. The ‘daang matuwid’ policy of the President is in full effect, there is no room for backsliding,” Escudero said. The CoA report on MWSS for 2011 stated that various allowances and benefits on that year worth P6.39 million was P5.88 million more than what was allowed in its operating budget. Escudero said that it appears the current officials of both agencies are taking a U-turn back to the crooked path with their requests for a status quo on the excessive perks their officials and employees are enjoying. He enjoined the CoA to enforce its mandate of reporting irregularities among state agencies and corporation and be aggressive in recommending appropriate actions to halt such irregularities. Escudero said that CoA also recently reported that officials and employees of the Department of Energy (DOE) were also found to have received more than P60.3 million in unauthorized yearend financial benefits and subsidies in 2010 and 2011. The CoA said Malacañang did not authorize the release of the money for yearend benefits and food and utility subsidy. The CoA has asked the DOE personnel to refund the P78,000 they each received. “We should move forward towards changing the culture in government and the way government conducts its business. It cannot be business as usual anymore,” Escudero said. The Aquino administration’s subsidies to government-owned and -controlled corporations (GOCCs) doubled in January to February this year, according to data from the Bureau of the Treasury’s (BTr) Statistical Data Analysis Division (SDAD). BTr data posted on its web site showed state subsidies to GOCCs totaled P3.07 billion in the first two months of 2013. A total of P1.53 billion in subsidies was released during the same period last year. The subsidies amounted to P244 million and P2.82 billion in January and February this year, respectively. “Let’s not forget that just three years ago, we were up in arms over these excessive perks. We should not forget so easily, otherwise we run the risk of repeating these mistakes simply because we let our guard down,” Escudero said. ORMOC CITY, Leyte – Philippine Army soldiers from 19th Infantry (Commando) Battalion led by 1LT Rod Vincent F Babera and members of Share-Me-A-Dream, a Bisayan Community Club of Victoria from Australia successfully conducted a medical mission to the poor families of Ormoc City last April 14, 2013 at Claretian Mission Centre, Barangay Milagro, Ormoc City. The whole day activity which started at 8:00 a.m. until 5:00 pm last Sunday was participated by doctors and dentists from Ormoc City who rendered free services such as operation tuli (circumcision) and dental and medical consultations. There were at least three hundred fifty (350) beneficiaries of the said medical mission who came from different barangays, namely: Liberty, Cabingtan, Gaas, and Lake Danao. It is noted that these barangays are formerly guerilla bases that where influenced by the communist terrorists. Other services provided were transportation and free haircut. The Commanding Officer of 19IB, Lt Col Joel Alejandro S Nacnac, upon receipt of the invitation for this medical mission was in full support because he believes in serving his countryfolks in whatever form it may be. According to him, “we are grateful for the kind-hearted Filipinos from other countries who extended a helping hand.” He is hopeful that this activity will prove that the government cooperates with the NGOs and the people to maintain the peace and order in the Province of Leyte. “The Share-Me-A-Dream is responding to the growing needs of medical assistance to the less fortunate people from poorer communities who could not afford appropriate healthcare due to geographical and economical challenges,” according to Ms Maria Theresa Symes, the Club President. It was founded on June 23, 2011 and since then actively helping the less fortunate.